Tomitaka Air Base served as a support base for kamikaze operations carried out from Kanoya Air Base starting in March 1945. The Jinrai Butai (Thunder Gods Corps), which made ohka manned glider bomb attacks, and its escorting fighter squadrons used Tomitaka Air Base. Kamikaze squadrons from air bases at Omura, Genzan, Tsukuba, and Yatabe came first to Tomitaka prior to proceeding to Kanoya, where they made their final sorties toward Okinawa. Regular flight training stopped at Tomitaka Air Base on February 20, 1945, when Kamikaze Special Attack Squadrons were formed from Type 93 Intermediate Trainers (nicknamed Akatonbo or Red Dragonfly) at the base. These kamikaze squadrons transferred to Iwakuni Air Group in Yamaguchi Prefecture on March 1, 1945, due to Tomitaka being in southern Kyushu, which was more susceptible to American bombing. From July 1945, these squadrons returned from Iwakuni to wait at Tomitaka Air Base and Kushira Air Base for orders to sortie, but they still had not received orders when the war ended on August 15, 1945. The monument inscription states, "Kamikaze Special Attack Corps Sortie Site." Although many kamikaze squadrons took off from Tomitaka, no kamikaze aircraft made direct attacks from this base. Instead, they proceeded to other air bases, mainly Kanoya, where they sortied to make suicide attacks on American ships. In the area near here, there are the remains of the former Tomitaka Naval Air Group airfield, which became a special attack base in the last part of World War II. 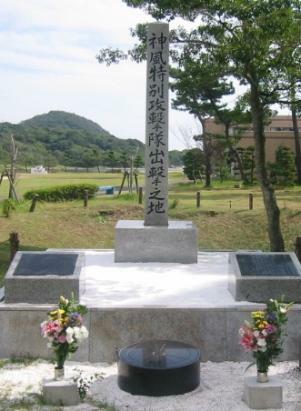 This monument was built to console the spirits of the Kamikaze Special Attack Corps members who took off from this base to sacrifice themselves for their homeland in a time of crisis and did not return again; the spirits of the local resident, mobilized student, Korean, and Chinese workers engaged in the construction of this base who unfortunately fell sick and wounded; and the spirits of the officers and men of the U.S. Air Force who died in these foreign skies far from their homes. 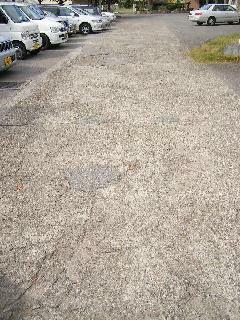 The area still has a couple of large holes from B-29 bombing of Tomitaka Air Base. One of these holes is directly behind the monument. This place used to be the air base of the Kami-Kaze pilots. And this monument should be dedicated to the peaceful rest of the souls of the Kami-Kaze and the U.S. pilots who were both killed around here for their own mother countries. The grounds of this hospital played an important role during World War II as the base of the Tomitaka Naval Air Group and as a frontline base in the last part of the war. The concrete section in front of this information sign is part of the runway from that time as it was during wartime. Before the peace of our time, special attack planes took off from this concrete runway. We preserve this runway in our desire for eternal peace. My visit to view the Tomitaka Kamikaze Special Attack Corps Sortie Site Monument was made possible with the kind assistance of Toshiyuki Nagahama, a former member of the Jinrai Butai (Thunder Gods Corps) who stopped by Tomitaka Air Base two or three times during WWII. I also want to thank Yoko Hori, Chairperson of the Board of Directors of Kyowa Hospital, and Hiroshi Kanemaru, Administrative Manager of Kyowa Hospital, who explained the history of the monument and provided me with material about the history of Tomitaka Air Base. The history of Tomitaka Air Base presented on this page comes from Ikeda (1992, 188-94, 298). Ikeda, Teruchika. 1992. 40 nengo no arubamu (Album of 40 years ago). Miyazaki City: Koumyakusha.